Don’t panic. This looks like a lot of work, but it’s not. Everything can be made ahead and each item in itself doesn’t take long to throw together. Additionally, many of the ingredients overlap, so you’re not buying as much as it looks like you need to. AND, lastly, there are actually several meals in here: North African Burgers, Pizza and Leftovers. You’re welcome. So, let’s focus a beat. Let’s talk about gifts before we start playing with yeast. First, I still haven’t bought anything. For fact. Not sweating it either. Not sure what that’s about, but I’m keeping the faith that it will all happen…somehow. I’ve had different holiday gift-buying phases thought the years…usually dependent on geography. When I lived in southern California, I would meet my cousin Kelly (#iambubbie) at South Coast Plaza after work and we would shop until the stores closed at midnight. We’d have a long dinner with too much wine, which would in turn make me spend wayyy to much money. Good times. When I moved to Beijing, it was more binge shopping. The day was spent hopping around the city from the best English-language bookstore in the CBD, to the hutongs for clothes, matches and crap, and finally the markets for knock-off (or hot) electronic merch for the kids. I wouldn’t mind some of that shopping right now. I like binge shopping…it suits me. I haven’t quite worked out my living-in-the-sticks, binge-shopping ways. I’ll let you know once it’s sorted. This apron. That’s all I’m saying. Because 350 days out of the year it’s not ok to drink whisky before noon. Sigh. That’s just the world we live in. This should tie us over in the wee morning hours. PS If you want to know the way to my heart, show up with a bottle of Pappy and a really fun mood. Done. This book and this book. Both beautiful books about food. A couple of my favorite cookbooks this year: Cookie Love, Bouchon Bakery and Seven Spoons. This cookbook makes me want to be a better person. Everything in it is pious + delicious. Total stocking stuffer material, but these NEST products. My scent: Moroccan Amber. It’s…to die for. Polder’s Old World Market. I’ll take all of it. Make that two of each, so I have backup. Flask mittens….mandatory. I think we all need these. Like yesterday. Any candles with vetiver. Like this one from Malin + Goetz. This market tote. In my mind, when I’m carrying this bag, my life is incredibly organized; everything in it and my belly is clean and locally sourced. As I wander through the farmer’s market, I muse on my well-behaved and impeccably dressed kids, the trip to Europe I’m leaving on tomorrow and I fleetingly worry that I haven’t bought enough clothes to wear a new outfit each and every single day that I’m gone. I have a dog, but somebody else cleans up its’ poop, so I don’t give it another thought. The reality if I had this bag? My keys would be lost forever lurking between used tissues and old receipts. I mean, if we’re going to know each other, let’s be honest. Carry-On Cocktail Kits for both gin and tonics and champagne cocktails. Because I like options. This bag. This last one is for my parents…I’m hoping it will be stuffed with the camera + lens(s) of my dreams. I’m kidding…I already know they got me gift #1. Yay! You can make your dough up to three days ahead of this dinner. Mix and knead up until step 3 and then cover tightly with plastic wrap and place in the fridge and forget about it. The day you’re ready to bake it, bring it out of the fridge and place it somewhere that’s slightly warm and bring the dough to room temperature (this will take several hours). Then jump to the Back to the Dough section and move on with the recipe (I’m assuming you pre-prepped everything in this scenario). Pizza sauce can be made several days ahead. In fact, giving those flavors 24 hours to mingle isn’t a bad idea. Yogurt sauce could easily be made several days ahead. Same as the pizza sauce…it’ll just get better. Make the sausage the night before. I have you shape the sausage into patties. You won’t come even close to using all of it…so make some yummy burgers with the patties and shove some feta, red onion and yogurt sauce in there while you’re at it. I mean, could you deliver this to my house? That sounds amazing. 1 12-ounce bottle of warm beer; put the beer bottle in a bowl with hot water for around 30 minutes to get it to the desired temperature. You want it to be pretty warm to set off the yeast. I’ve used dark, I’ve used light, I’ve used cheap, I’ve used expensive…all work fine, in my eyes. I do prefer the light beer. **You can sub in warm water if you prefer not to cook with beer and it will still turn out delicious. Put the warm beer, yeast, honey and olive oil in your electric stand mixer fitted with the dough hook (you could alternatively mix by hand and knead the crap out of it if you don’t have a mixer…don’t let that stop you). Let these guys mingle in there for about 10 minutes while they get all foamy and frothy. Add 3 cups of flour and the salt to the beer concoction and put the mixer on low. Once the flour is incorporated into the dough, increase the speed to medium. For the next 15 minutes, continue on at this speed, adding the last 1 cup of flour, 1 tablespoon at a time, to keep the dough from sticking to the sides. When it’s done it should be smooth and elastic. Lightly oil a large bowl, put the dough in there tossing to coat it with the oil and cover the bowl with plastic wrap. Set the bowl in a non-drafty, semi-warm (but not hot) area of the house. Set the timer for 1 hour and start on the sausage and sauces. That might be the name of my autobiography. In a jar, preferably one with a lid, mix the tomato sauce, red harissa sauce, olive oil, salt and whole smashed garlic clove. You’re done. If you’re making the pizzas today, just leave it out on the counter. It looks pretty and I like to admire my work. 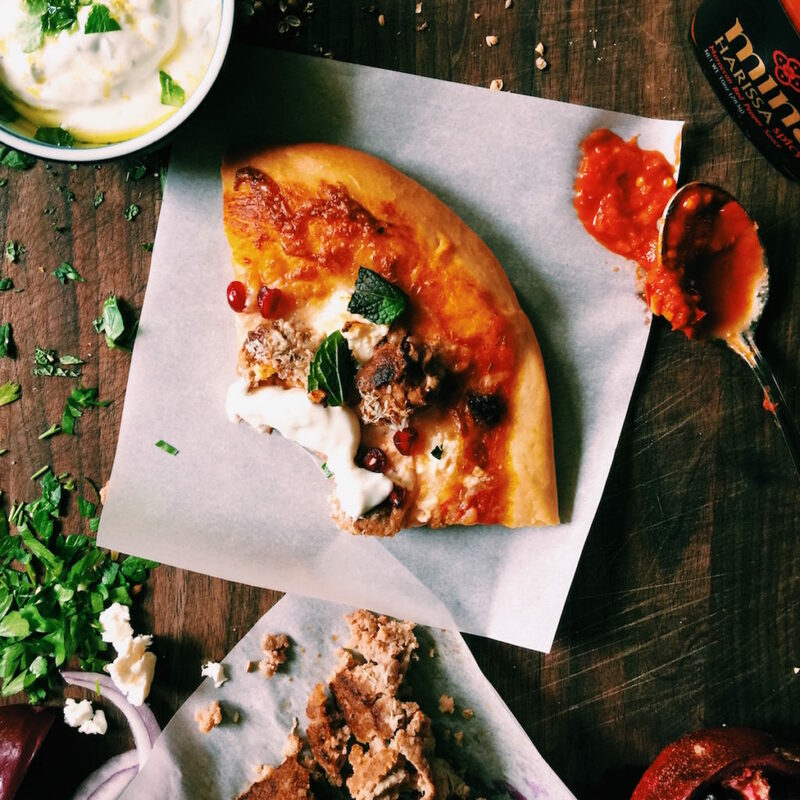 If your pizza making is days away, stash it in the fridge…it’ll just get better. One last quick note…taste the sauce…feel free to add more harissa if you want to kick it up a notch. Grab another jar, also ideally with a lid, and shove the yogurt, lemon juice, garlic, olive oil, parsley and mint in there. Shake it around. Give it a taste. It’s good right? Use some buttermilk or milk to thin it a touch if you want to drizzle it over the top of the pizza. Otherwise you can leave it nice and thick for dipping…your call. Put in the fridge until you’re ready to use it. Oh, one last note…if you have left over parsley, mint (and even some lemon zest?) save it in a plastic baggie and use it to garnish the yogurt sauce when serving. Mix the salt, all-spice, black pepper, coriander, cloves, cumin, cinnamon, ginger and cayenne in a small bowl. In a large bowl add the ground turkey, red harissa paste, garlic and the spice mixture you just created and mix until combined. Form into 4 to 5 patties, depending on how big you want your patties. Heat a large skillet (I like my cast iron for this), over medium heat. Once warm, drizzle with a little bit of olive oil to keep the patties from sticking. Cook the patties about 8 minutes per side…if yours are thicker than mine they may take more time and likewise they’ll take less time if they are thinner…since I can’t see yours use your judgement, you got this. Set them aside to cool. Crumble up the ones you want to use (into large chunks) and wrap up the ones you will eat later. Seriously, make a burger out of these. You’ll be really excited you did. If you won’t be using them soon, wrap them up tightly and put them in the fridge. Punch the dough down and divide it into 6 equal-ish balls. Try to make the balls as round and smooth as possible. If you take care to do this now, they’ll be easier to roll out in an hour. Cover a large baking sheet with parchment paper. Lightly dust it with flour and set the balls, several inches apart, on the baking sheet. Cover the dough balls with plastic wrap and then put a damp towel over the top. I do the damp towel thing at this step because it has been so dang dry and I hate it when my dough starts to dry a bit around the edges. If you live in a really humid area, skip the damp towel. Set the covered baking sheet in that same, warm, non-drafty area that the dough was rising earlier. Set the timer for 1 hour. You could grate some cheese, slice some onion and chop the herbs during this time. Or, you could go lay down and take a catnap. Both work. Preheat your oven to 500 degrees F and put a rack in the top third of your oven. Place parchment on your baking sheets and sprinkle lightly with corn meal (the cornmeal is optional). Grab a ball of dough and begin to roll and shape it into something that’s round-ish. Sometimes it’s oval, just go with it. Don’t roll it so that it’s too thin…you’ll regret it. When you’re rolling out, let it be a little bit thicker around the edges (crust=yay!). 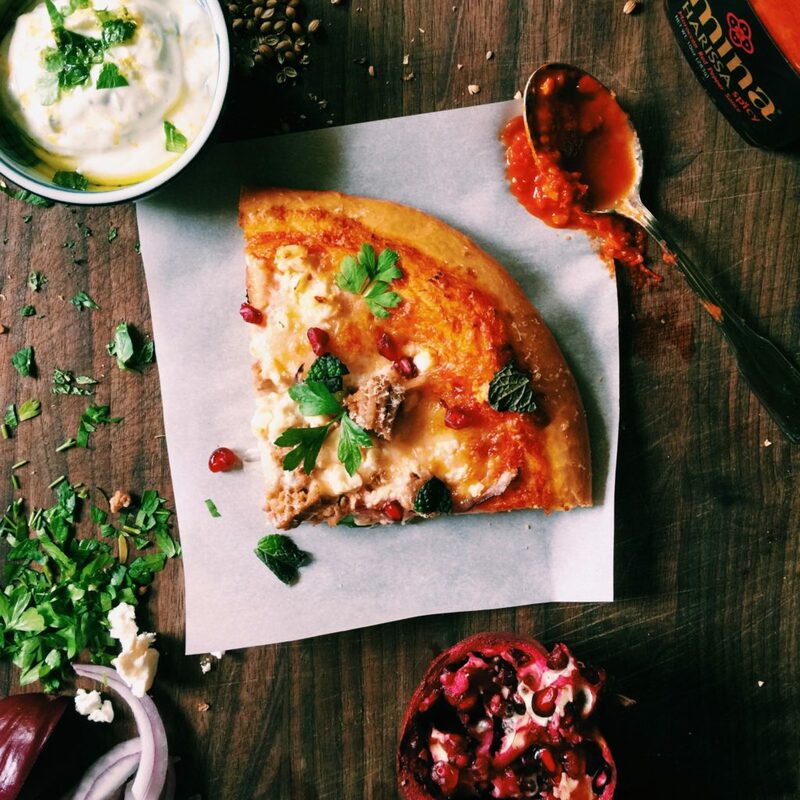 Put a light layer of sauce on your pizza, leaving a roughly 1 centimeter border around the edges. You think you want a ton of sauce, but you don’t. Trust me. Show a little restraint. Put a light layer of mozzarella over the sauce. 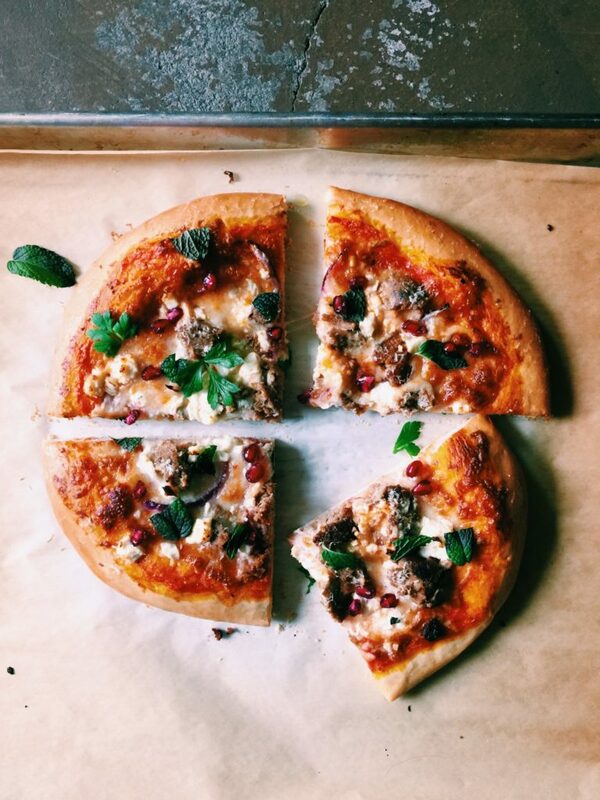 And then add a sprinkling of sausage, red onion and feta making sure it’s evenly spread across the pizza so that each bite is delicious. Finish with a healthy dusting of parm. Put the pizza in oven for 15 minutes. Check around 13 minutes to be sure nothing is burning. When done baking, I like to let my pizza cool a beat on a cooling rack…it will let the cheese set a bit and ensure your crust stays nice and crisp. 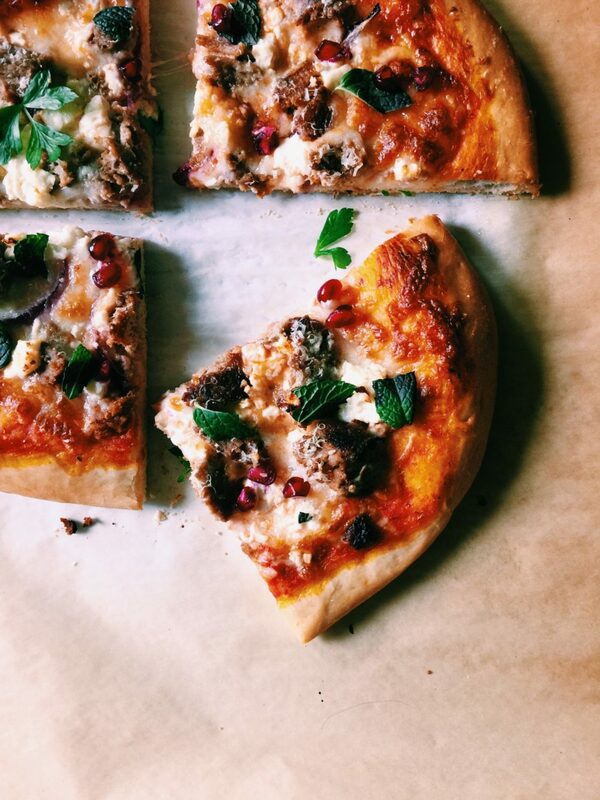 Sprinkle the cooked pizzas with chopped parsley and mint, as well as some pomegranate seeds. This is begging for a glass of wine…could you be a dear and get two? Thanks. Was super excited that Hedley & Bennett (also super amazing aprons), Food52 and America’s Test Kitchen featured my photos on Instagram!! Can I be grateful + boastful…just for a sec? I have lots of fun, exciting recipes coming up…I’m glad you’re here. Can I say that real quick? It’s been an awesome year and I have you guys to thank. Some quick, weeknight dinner options…because we’re all too busy right now: harissa chili, pad thai, cheddar corn chowder, white girl mexican soup, quinoa + turkey patties and honky kung pao chicken. 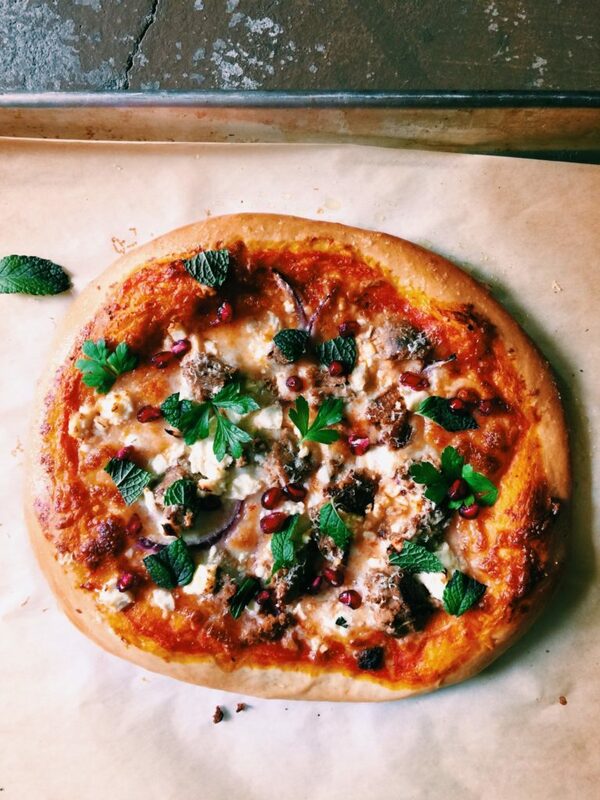 My original pizza recipe is here. This is a perfect base recipe…learn it, know it, it live it. The beer in the crust is a game changer. If you make any of DisplacedHousewife’s recipes, would you use the #displacedhousewife so I can see them? I love when I see what you’ve made!! This post was made possible by the awesome generosity + products of Mina + Hatchery. I wouldn’t say no to either as presents or stocking stuffers. OMG the dipping sauce looks so good! You are a genius! Looks delicious! I’m really sorry I can’t sample some now! Wow this looks good! I can’t wait to try the recipe! !